Our family just moved to a new home. What a monumental job it was transferring all of our worldly goods from one place to another. Fortunately for us our migration was only a few miles away so it was a relatively easy transition. But it made me ponder what moving was like for many people in years gone by. In my story "Proving Up" in Homestead Brides that releases in February, my main characters are Swedish immigrants who helped settle the real town of Swedeburg, Nebraska. Moving was no light task for people back in those days and they had to re-establish their lives and livelihoods all over again. Many folks sailed to America with little more than the clothes upon their backs and a few treasured possessions. Some carried a traveling chest containing all of their worldly goods. 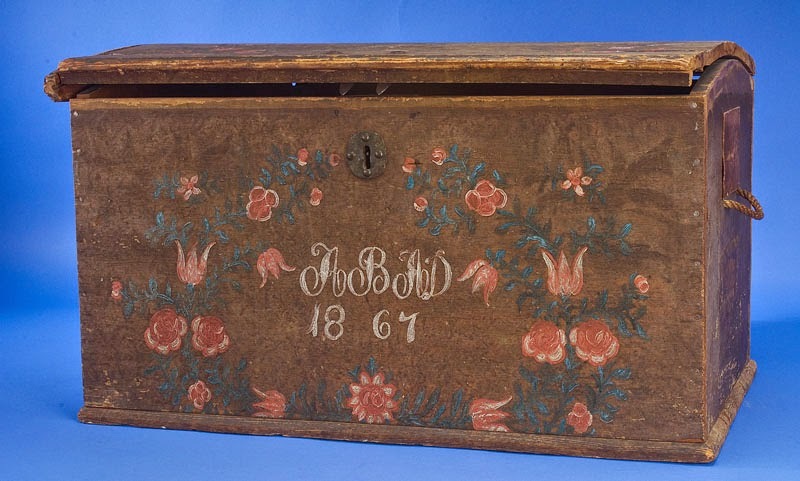 Certain cultures hand painted their trunks to identify them. Others used "steamer trunks". I used cardboard boxes, but of course I wasn't moving overseas. 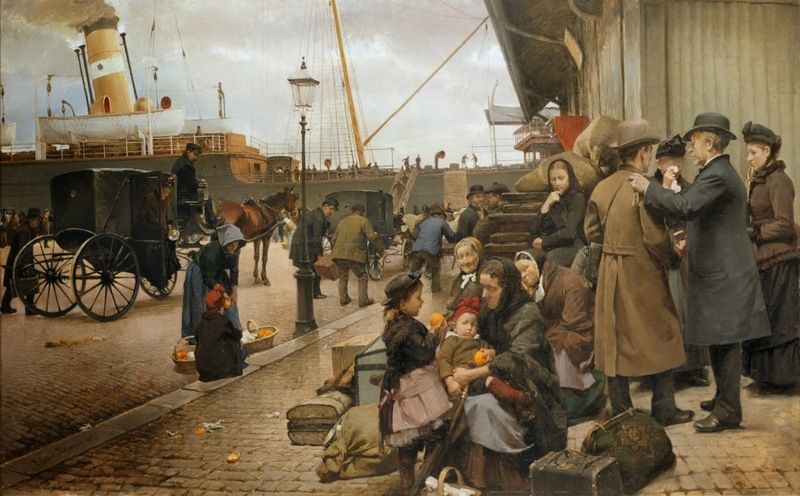 People have always moved in dribs and drabs, but there have been many waves of immigration to America such as those of pilgrims to Jamestown and the Mass Bay Colony, The Great Migration of the early 1600's, the Irish Potato Famine Immigration, and the many who came through the major ports like Ellis Island in the age of steam. 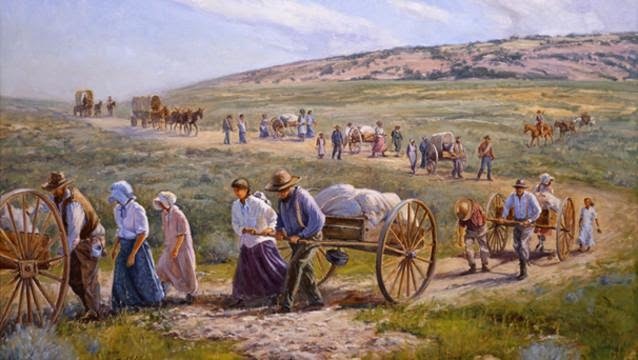 There have also been periodic movements of migration such as Manifest Destiny, and other periods of westward expansion like during the Gold Rush and Homestead Acts. And there are many reasons historically that have allowed for migration such as treaties and improved transportation. There was no U-haul back in day, but people moved by ship, locomotive, wagon, and even on horseback or foot. Many migrated in groups by wagon train, an arduous journey over untamed land, even providing their own "horse power". At times loads had to be lightened and many valuables where lost along the way. There have been times throughout history where people have been relocated against their will to reservations, or exiled because of persecution or as prisoners of war. At times individuals have chronicled their moves and provided others the opportunity to read about their experiences. There are many reasons and ideals that motivate people to move: among them land, housing, vocation, religion, health, and family. But whatever the reason, moving will remain a part of this life. Immigrate - to come into a new country to live. Emigrate - to exit current homeland to settle permanently in another. Migrate- to move from one place to another, temporarily or permanently. Move - to change place, position, or state. Have you ever moved? What were your reasons? How did you travel? New Englander Carla Olson Gade writes from her home amidst the rustic landscapes of Maine. 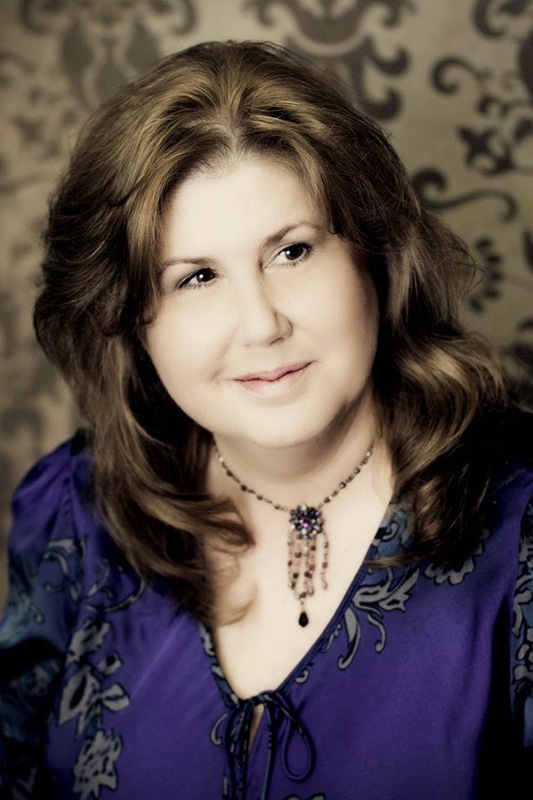 With six books in print, she is enjoys bringing her tales to life with historically authentic settings and characters. An avid reader, amateur genealogist, photographer, and house plan hobbyist, Carla's great love (next to her family) is historical research. 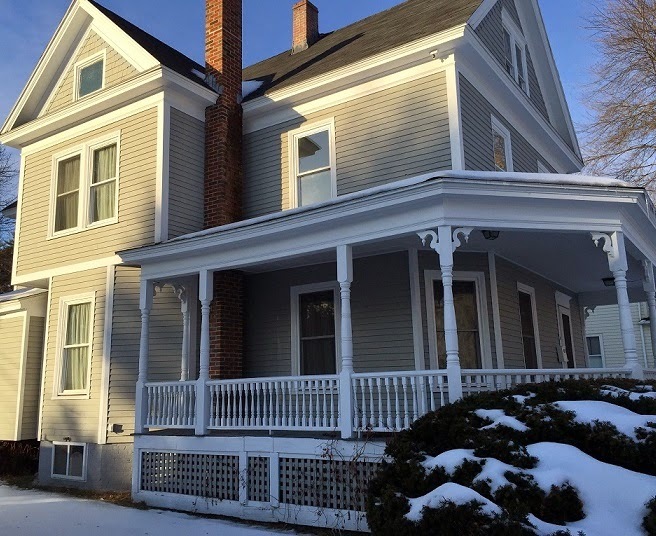 Though you might find her tromping around an abandoned homestead, an old fort, or interviewing a docent at an historical museum, it's easier to connect with her on her blog, Adventures of the Heart. Carla's novella "Proving Up" in Homestead Brides is available for order now. Between 2004 and 2008, I moved five times. Carla, We just happened upon a little film called, "The Trail," (which I at first suspected was Mormon propaganda, but there was no mention of anything specific to Mormonism.) It turned out to be a good film, although a rather harrowing account of one woman's journey to a new home gone bad--but with an ultimately happy ending. It's a survival story set in the days of westward movement and pioneering. (I love a good survival story, having just written a dystopian novel!) and we saw it either on Netflix or via Amazon's Instant Video Prime, at no charge. I think you'd enjoy it. Blessings to you and your family in your new home! In doing the research for my series about my ancestors coming to this country from France in the 1700's, I soon got the picture that those voyages were much more difficult than we can even imagine. In fact, my ancestor's husband was washed overboard on the trip over with all their money on him. So my ancestor, Louisa, arrived in Pennsylvania a new widow with not a penny and two sons. These "moves" to the New Country were life changing events. Thanks for the post. And Linore, thanks for the tip on "The Trail." I'm always on the hunt for a good movie! Your new house is beautiful, Carla. I hope you make many wonderful memories there. I moved every year or two when I was a young girl. Making friends was hard for me, leaving them even harder. Because I was forced to start over so many times, I overcame some of my shyness, so that was a hidden benefit.